Each Laguna Beach festival is an amazing display of creativity. 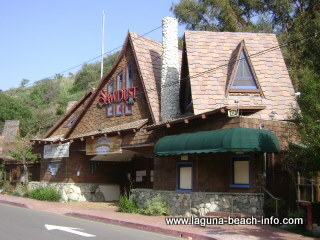 Many visitors come to Laguna for the first time, because they are drawn to one of the annual events. There are several major art festivals hosted in town each year. The four most popular include: The Pageant of the Masters, Festival of the Arts, Sawdust Festival, and Art A Fair. 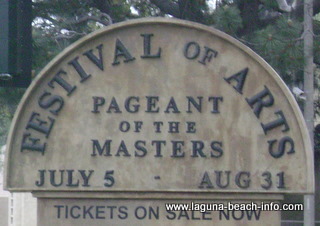 The original Laguna Beach Festival of the Arts was hosted in 1932, as a secondary event which would draw tourists after they left the Los Angeles Olympics. However, over the decades this expansive collection of incredible artists has grown to be recognized as a major artistic tradition, where visitors can find the highest quality of virtually every form of media. World class artists at this Laguna Beach festival display all original paintings, sculptures, pastels, drawings, serigraphs, photographs, ceramics, jewelry, etched and stained glass, fiber arts, and handcrafted furniture. And since the artwork is for sale, as you explore through the 6 acres of artwork, you might find pieces that are perfect for display in your home or business. The Festival of the Arts is open from early July to the end of August. Admission is free to Laguna Beach residents (and children under 12), and only $7 for visitors. If you purchase a ticket, it will serve as a season pass which will continue to get you in for the rest of the season! Daily events include docent-led tours describing the artistic process and features of various works and media, hands-on demonstrations of painting, ceramics, and printmaking, and even a collection of works from selected student artists. Every Laguna Beach festival is a little different... however, the Pageant of the Masters is an event that is completely surreal. From July 7th through Aug 31, at 8:30pm each night as darkness settles upon beautiful laguna canyon, the performance begins. For 90 minutes famous paintings are recreated before your eyes like you've never seen before. As towering picture frames are moved into place, and backdrops are set in frame, actors who are sometimes painted head to toe walk onstage and into the framework of the art, positioning themselves perfectly and becoming each work of art. With music, narration, carefully crafted sets and lighting, you will be mesmerized by the transformations during each instance when the volunteers onstage stop moving, and become a work from the masters! Each year the theme of this Laguna Beach Festival is different! For 2010 expect to see works fitting "Eat, Drink, and Be Merry" celebrating the beauty of the moment. Pageant of the Masters ticket prices vary depending upon many factors including: seating location, night of the week, etc. 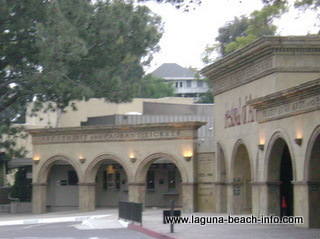 There is also a gala performance of this Laguna Beach festival on Sat, Aug 28, 2010. More information about Pageant of the Masters. This Laguna Beach festival is dedicated to educating the public and promoting art that is created locally in Laguna Beach. The Sawdust Festival hosts several annual events including the Winter Fantasy, Spring into Art, and Autumn Art exhibitions. Weekend art classes are also available throughout the year utilizing many different media including: acrylic painting, flower arranging, glass blowing, oil painting, watercolors, and mixed media! During the annual summer festival you can explore and purchase art that is on exhibit from over 200 local artists featuring virtually every possible media. This Laguna Beach festival runs from June 25 - Aug 29 (10am - 10pm daily)and tickets can be purchased for $7.50. Senior discount tickets $6. And children 6-12 $3 per ticket. Find out more at Sawdust Art Festival. Art A Fair is a juried Laguna Beach art festival featuring 125 incredible artists from around the world and local artists from Laguna Beach, California! As you explore the grounds of Art A Fair you're likely to encounter master artists creating new works of art in many different mediums including; oil paintings, watercolors, acrylics, drawings, photography, digital art, mixed media, sculpture, jewelry, ceramics, glass and wood. Find out more at Art A Fair Festival. Submit Your Laguna Beach Festival Recommendation! 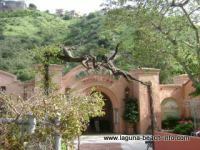 Return from Laguna Beach Festival to the Laguna Beach Info Home Page.